Lewis structures provide you with a simple way to draw out an organic molecule showing every atom, bond, and lone electron pair. While not ideal for demonstrating bond angle and molecular geometry, it’s a great way to begin your understanding of molecules and bonding in organic chemistry. Every professor will show a different set of ‘rules’ for coming up with a correct structure. I find each one to be more confusing than the next. The video below teaches you my trick to ensure you are on the right track to drawing the most appropriate Lewis Structure for a given molecular formula. 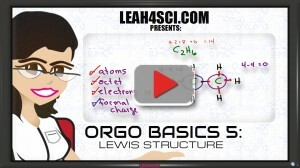 This is Video 5 in the Orgo Basics Video Series. Click HERE for the entire series. Here you add extra electrons to atoms than they have in their valance shell. Like, you showed 6 e- to Nitrogen (in CN-) and a bond as well i.e. total of 7 electrons but Nitrogen only has 5 electrons in its valance shell and only valance shell electrons take part in reactions. Please explain.